Me and Jason watching the sunset in Kino Viejo. 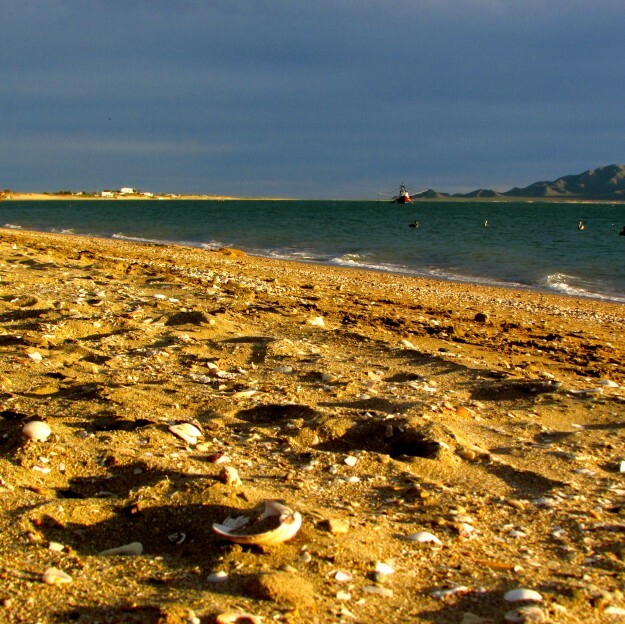 Now that Victoria and Jason had decided to skip the ferry ride to the Baja and drive north through the mainland instead, we had a LOT of ground to cover. In case you don’t have one of those map thingeys, Mexico is like, really big. Even after all this time spent in a very cool country, we still hadn’t seen the whole top half! Though driving days are a snooze, I was kind of excited to check out all this new territory. We had a quick breakfast, packed up and left the Pemex Inn in the rearview. 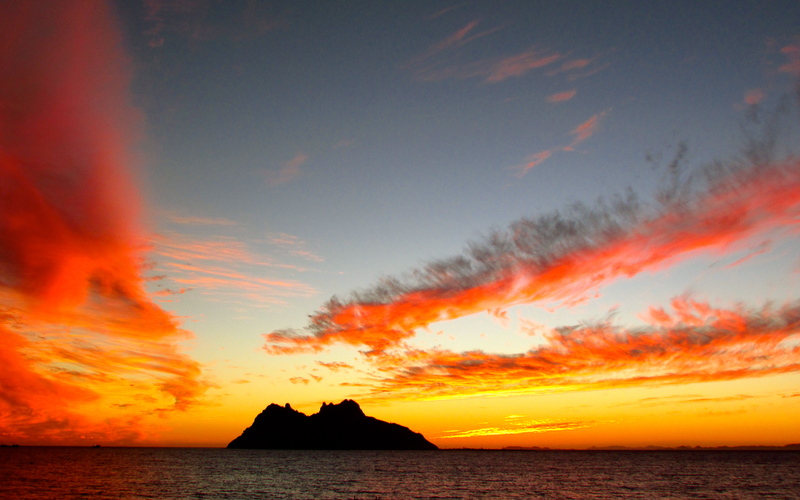 Our first stop was to be a town called Guaymas, and it looked like it was going to be quite a drive. To my dismay, the beach was nowhere to be found, and I started to wonder if I would ever see it again. We spent hours driving through farms covered in carpets of bright green, followed by deserts dotted by scraggly cactus, twisting roots and tiny, red and purple flowers. When we finally got to Guaymas, Victoria and Jason looked around in dismay. Giant RV park after giant RV park, and not much to see as far as nature is concerned. We still had loads of daylight left, so My Family decided to drive on. A bit further down the road I caught sight of the water. We were headed back to the beach after all! We drove through a really pretty town on a hill called San Carlos, wound our way along the coast and finally found a place to set up. Totonaka RV Park was HUGE, filled with hundreds of humans and tons of us dogs. We settled in next to a cement patio and got all set up. It wasn’t right on the beach, but I could smell the ocean on the air. An improvement. We spent several days here, and I wish I had exciting stories to share with you about that time. But I don’t. We recharged our batteries, Jason worked, Victoria read and enjoyed the sun, and Maya and I were stuck on leash. Yep, one VERY big problem with these trailer parks is the leash law. There’s no frolicking allowed for the dogs. People get to do basically whatever they want, and we basically have to sit there and watch the fun. We did get to go on some walks, and taste some of the delicious fish one of our neighbors gave Jason to cook, but otherwise the hours slipped into days that felt basically the same. We had one sort of fun night, hanging out with the nice human couple from Alaska named Chris and Jessie. Alaska is way far in the north, and they told us a how in the middle of winter it never gets light, and in the middle of summer it almost never gets dark. How crazy is that? The dark time I could do without, but a whole day of sunlight to play in? I thought it would be paradise, but after overhearing them talking about the temperature up there, I decided maybe I wouldn’t like it that much after all. Maya tried to snag the caribou jerky they brought over, so they were just fine in her book. We left Totonaka and kept heading north, through more hours of farms and desert. I don’t understand how so much green stuff can grow out here! I guess the Mexican people are pretty good farmers. We turned off the highway and found our next destination a town called Kino Viejo. The town itself was kind of sad, quiet, and mostly empty except for the loads of sad dogs that looked like they could very much use a big meal and a comfy bed to snuggle up on. This trailer park, however, was super cool. Islandia RV was small and sandy, not covered in gravel and cement, and Jason pulled us up in a spot right on the beach. Finally, back in my happy place! Every human we met there was so nice, and the dogs were pretty cool too. 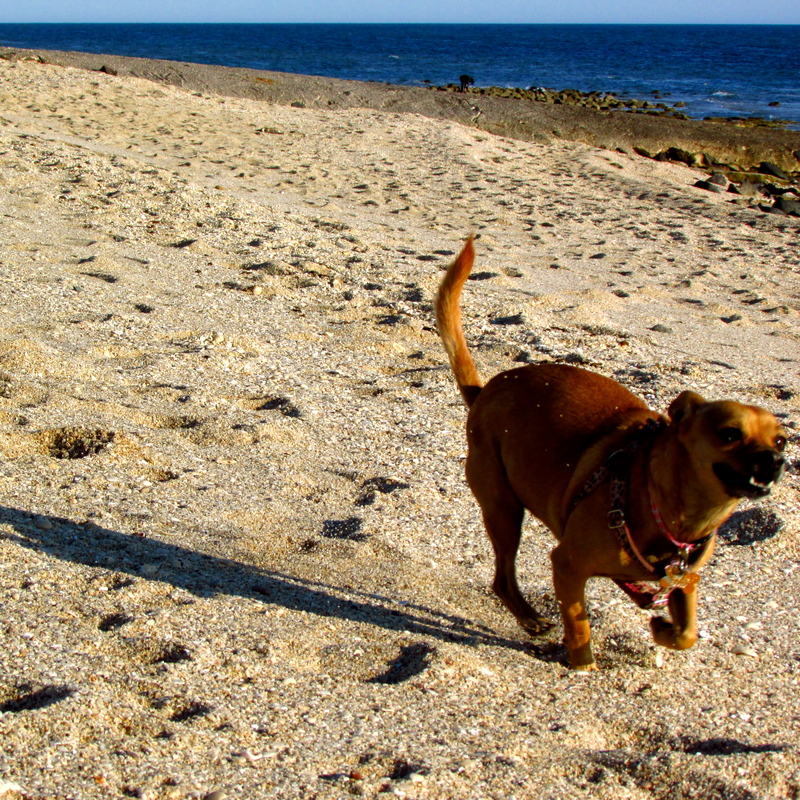 After unpacking, the leashes were finally taken away, and Maya and I were free to dash about. Finally, a beach to run on! What more does a dog need? Although it wasn’t planned, My Family decided to spend a couple of nights here. We had a great spot, with a palapa to shade ourselves under and a clear view of the beautiful water. 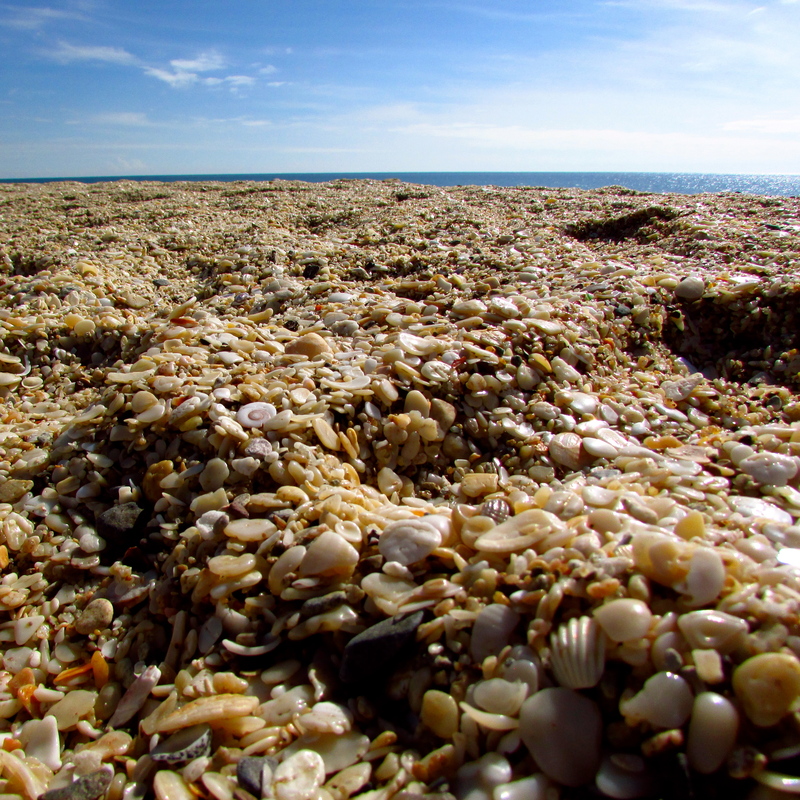 There were shells everywhere, and My Family wandered the beach, picking out some of the best to keep for souvenirs. Maya LOVES shells too. She doesn’t seem to care what they look like, as long as they smell tasty. Jason wasn’t too thrilled with this development, and spent hours dragging shells out away from Maya’s seeking tongue. Other than that, Bahia Kino was super cool. Long days, really pretty sunsets, and very nice snowbirds (still without feathers). 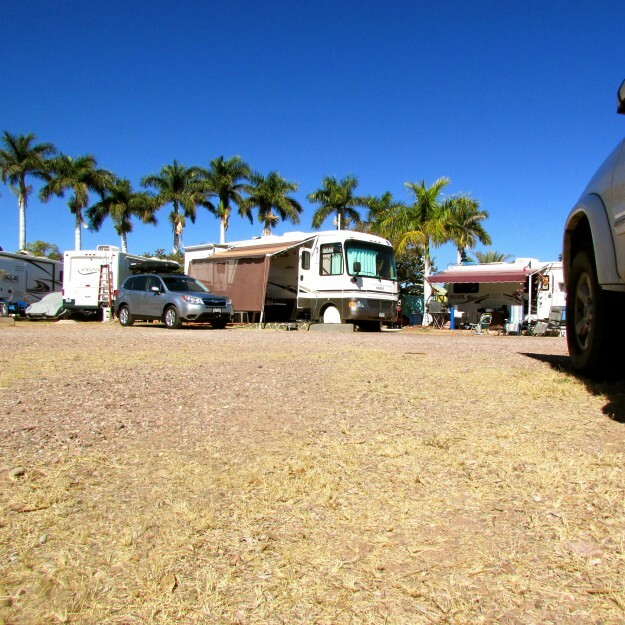 I don’t really understand why some snowbirds stay in their giant RV’s all day long (like in Mazatlan), while others sit out, go for rides, play games with their neighbors and have fun parties filled with music and delicious smelling food. I guess these snowbird creatures are just as varied as us dogs. Like how I’m not afraid of anything, and Maya runs away from plastic bags? I was sad to leave Islandia, but after a couple of days we had to keep moving north. The next leg of our Adventure entailed hours and hours (AND HOURS) of driving through the desert. Northern Mexico is very pretty, but I certainly wouldn’t want to be stuck out there without My Family! The road was also getting pretty treacherous. Jason had to speed up and slow down all the time, swerving from one side of the road to another to avoid the potholes. There was one stretch I thought would never end, and Maya was getting seriously green. She wouldn’t lay down, but just stood in the back seat, head lowered, tongue lolling across the towel she lays on. Not a happy camper on this day. When we got to Puerto Penasco, My Family was less than enthusiastic. Yet ANOTHER giant RV park, made all of gravel, filled with giant vehicles. This one at least was on the beach, but that didn’t seem to comfort Victoria or Jason at all. Apparently, the internet was bad and you had to pay extra to take a shower. Given how My Family was smelling these days, I really hoped they could come up with the extra cash. 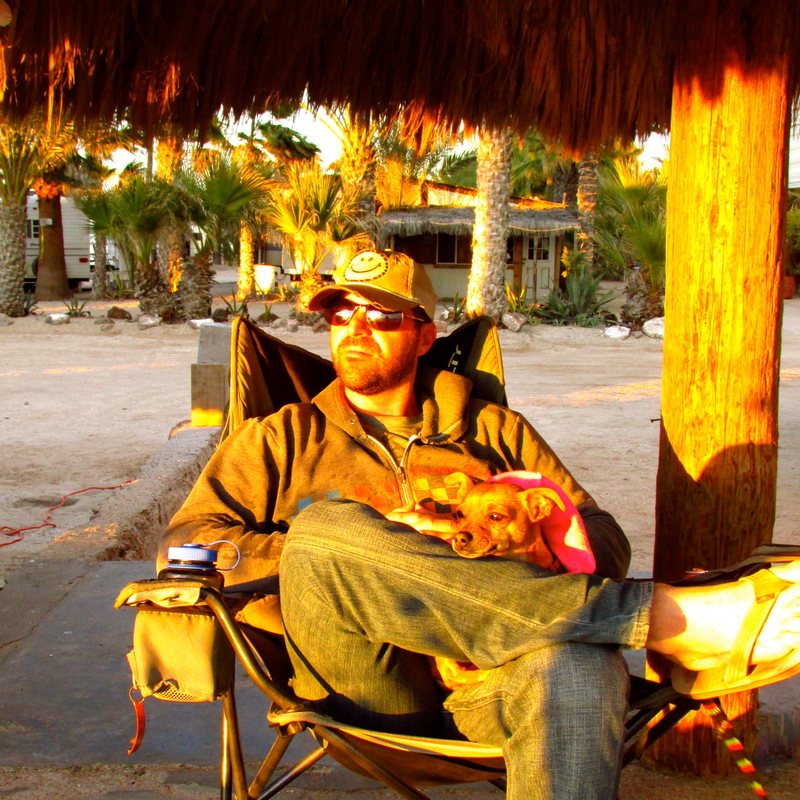 We spent a few days at the Playa de Oro RV park, and Maya and I were again relegated to our leashes. Jason complained that the view was particularly uninspiring, while Victoria was grumpy about everyone speaking English and paying in American dollars. I guess this Mexican town isn’t that Mexican? Victoria found out that where we were now was only a two-hour drive from the United States border, so all these people from the state of Arizona come down for long weekends. Quite a change from all the great Adventurers we had been meeting, who were all off on long country-crossing trips. I didn’t mind them that much. Everyone was pretty nice to me, and these folks do a lot of grilling! We weren’t going to stay long enough to make any friends, though. Victoria and Jason were eager to set off again. We were now the most northern we had been since first entering Mexico (more than fifteen months ago! ), and had almost finished our crossing of the top half of the country. Our next drive would take us back onto the Baja, and what I hoped would be an endless array of empty beaches, ready and waiting for my paws. The trailer parks we had been staying in weren’t bad. We always met nice people, and had comfy places to sit. However, it’s not much of an Adventure. Hey, after all the places we’ve seen, I’ve got high standards! And back at the very beginning of our journey through Mexico, the Baja sure delivered. PS: To see My Family’s photos from our time in the RV Parks, head over to Facebook.